BAGUIO CITY – Mayor Mauricio G. Domogan underscored the proposed bill pending in Congress granting another period to validate unvalidated 211 titles in the city will create more problems than solutions because it will result to the displacement of actual occupants of alienable and disposable lands that have reverted as properties of the State after the prescribed 15-year validation period. The local chief executive pointed out it will be unfair to those who are now in possession of the lands that have unvalidated titles once the government will re-open the validation period in favour of the titleholder of the unvalidated 211 titles because it will result to conflicts. “We cannot afford that our people will be quarrelling over the city’s limited alienable and disposable lands once the validation period will again be opened in favour of the holders of unvalidated 211 titles covering some portions of the city. The matter should be seriously studied so that it will only be applicable on a case to case basis,” Domogan stressed. 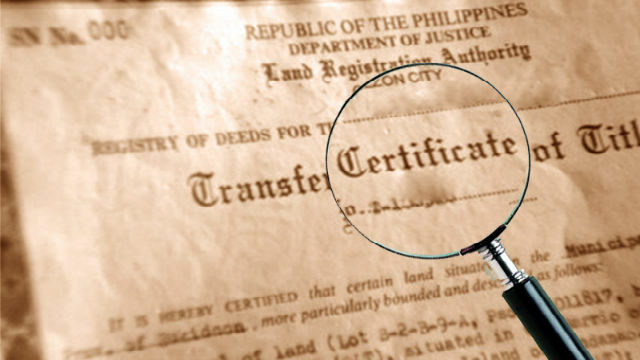 If the titleholder of the unvalidated 211 land title is still in actual occupancy of the property without any other actual occupants, he said that there might be consideration to the request to open the period of validation of the unvalidated titles. However, if there are already actual occupants of the property subject to the proposed reopening of the validation period for the unvalidated 211 titles, Domogan emphasized that he will not be in favour of the enactment of the law that will grant another validation period for the unvalidated 211 titles because it will result to more problems to the concerned government agencies and the local government because it can create rifts among the actual occupants and the titleholder of the unvalidated 2111 titles supposed to be validated. He claimed that the 15-year validation period granted by former President Ferdinand Marcos to the titleholders of unvalidated 211 titles in the city was actually more than sufficient for everyone in possession of the said title to be validated during the prescribed period. He warned residents living in areas covered by unvalidated 211 titles to be careful of the sugar-coated promises of some politicians aspiring for different elected positions in the city so that they will not be tempted to be unnecessarily shelling out their hard earned money in exchange for the action of lawmakers that will favour the granting of the revalidation period which has more danger than the prevailing situation on the status of lands in the different parts of the city. Domogan asserted with the mere fact that the 15-year validation period lapsed, the status of the lands covered by the already invalidated 211 titles reverted to the domain of the State thereby achieving alienable and disposable status that could be applied upon by the actual homelot applicants. He said there is a need to seriously consider the impact of the granting of another period to validate the invalidated 211 titles to first ascertain whether or not the lands covered by the invalidated land titles have actual occupants to preven serious negative implications to the status of lands in the city.